Your customer’s protection and privacy will no longer be a concern with the Martin Yale UC-5500 ScriptStroyer. This pharmacy shredder conforms to HIPAA guidelines for patient information destruction which is something every pharmacy should have. The UC-5500 destroys plastic bottles up to 3-1/2” in diameter, lids, adhesive labels and all paper up to 10 sheets at time containing patient information, reducing the risk of identity theft. 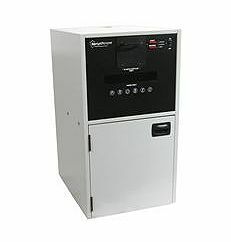 The UC-5500 ScriptStroyer has been manufactured specifically for pharmaceutical and medical applications to your protect customer’s identity. This machine is designed to fit under the counter for convenience and it is also very quiet so it can be used in pharmacies or doctors’ offices without causing a disruption. The self-lubricating cylinders make shredding adhesive labels trouble and maintenance free. If you have any questions or are interested in purchasing the Martin Yale Pharmacy Shredder, visit us at SpiralBinding.com. We have great pricing on a full line of Shredders. Call us at 1-800-631-3572 for more information!